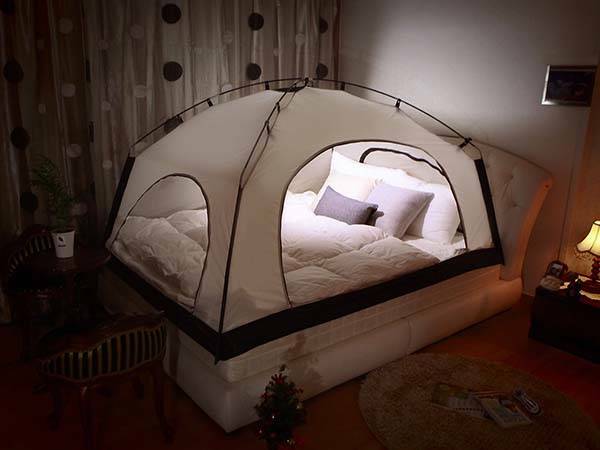 The bed tent not only brings the fun of camping trip onto your bed, but also delivers you a warm space in winter. Sounds cool? Let’s go on for the Room in Room bed tent. The Room in Room is a uniques and functional indoor tent designed to make your bed warm and comfortable in winter without overpriced gas bill. As we can see from the images, the bed tent shows off a sleek and elegant design, and the solid white body can be easily blended with any mattress, meanwhile, it comes in different sizes in order to work with mattresses with different sizes. 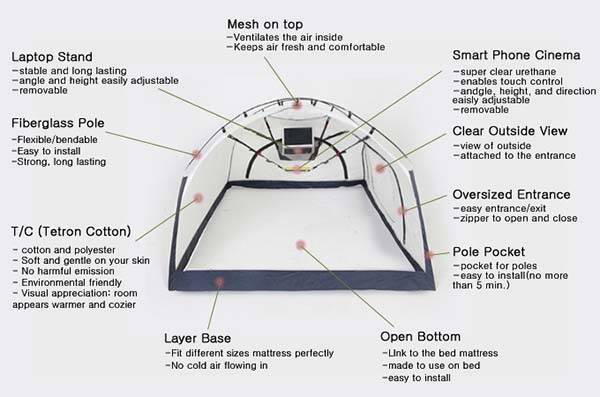 As a functional bed tent, the Room in Room delivers you a specially designed room on your bed that can conserve and circulate heat inside and block the cold air outside in order to make your bed warm and comfortable in winter without needing to completely rely on your heater or air conditioner. Moreover, the bed tent’s main fabric body is Tetron Cotton combined with polyester and cotton, which creates a comfortable sleeping environment without harmful emission, and the high density textile is capable to maximize heat conservation inside the tent. Th skeleton of Room in Room is made of aluminum 6061 for a lightweight and durable structure. Furthermore, Room in Room also features an adjustable laptop holder that provides you a private and comfortable work station. In addition, an integrated and adjustable phone holder keeps your smartphone above head, so you can watch your favorite videos when lying in the bed. The Room in Room has been available for preorder via Kickstarter. 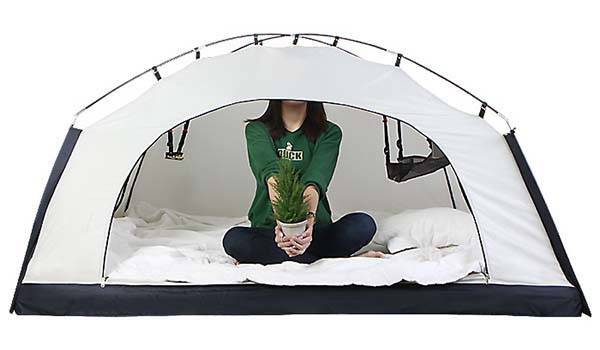 You can pledge $80 to preorder the bed tent. It will be shipped in January 2016.